I think media has power to control time. Each medium has an unique way to alter the time. 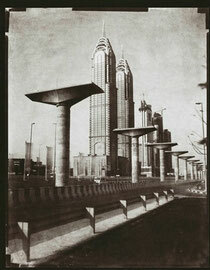 The picture of Dubai in 2008 was taken with Carotype prints technique from early 19C by French photographer Martin Becka. It looks like a future vision from 20 century.